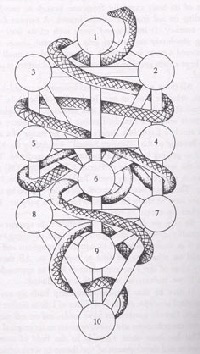 The picture depicts the Serpent of Wisdom coiling around the tree of life. 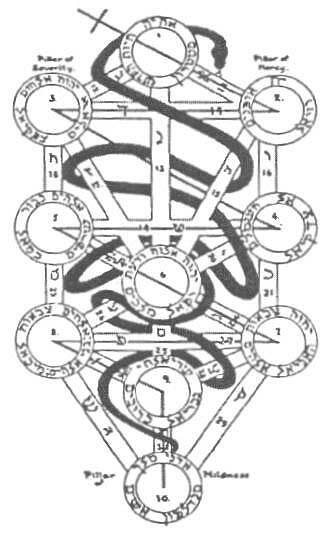 It's body indicates the steps in the mystic ascension of the student on the Etz Chiim (Tree of Life). The sequence in which its body touches each path is especially important - as well as wether it crosses behind or in front of a path. If you are interested to learn more about it, I recommend Gareth Knight's essential 'A Practical Guide to Qabalistic Symbolism'. In light of the Dweller article - just take a look at the body of the snake below Tiphareth... Looks pretty much like the body of the serpent is shaping the veil of Paroketh. The picture is available here in poster size as a free download to anyone interested. Just open the 'Serpent of Wisdom' folder and download the picture (17 MB). I won't claim copyright on it, so feel free to reproduce.